She’s the gal for me! Question: What card do I pull the most often? Why do I think that is the case? I had a look back through the Tarot cards that I have pulled when I was selecting a Court Card’s energies to guide me from a) the dark moon to the full moon or b) the full moon to the dark moon. 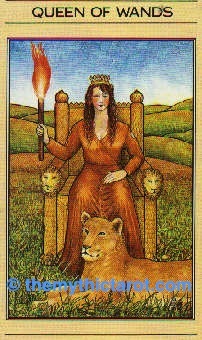 The card most drawn is the Queen of Wands. I’m quite pleased about this as I am working towards being a bit more Queen of Wandsy. Naturally, I think I tend to live in my interior landscape, mainly inside my head, as per the suit of Swords. I admit that I am more comfortable relying on my thought processes than, say, on my emotions. I find my emotions unreliable and easily influenced by things like music, art and hormones. I went to an art exhibition in Glasgow a couple of years ago that featured the work of the Glasgow Boys. I got all weepy over a painting of poppies, their gorgeous petals scattered around their vase. I burst into tears. Which was quite unexpected. And hugely embarrassing. I put it down to being Hormonal. So, emotions are, for me, fickle things that can be influenced by a poorly-timed listen to a Leonard Cohen CD. That said, I am quite happy to change my thoughts about things if the facts call for it! The Queen of Wands is a Goal character for me, so maybe that’s why she appears so often? So, I’d love to know – what card tends to crop up in your Tarot work, for yourself? What does its repeated appearance mean, for you?